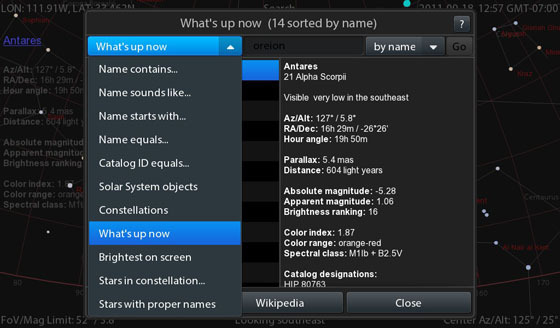 Back in September we got introduced to a rather awesome BlackBerry PlayBook application called What's Up. The application is an astronomy application that allows you to input your zip code and show real time updates of the position of the moon and sun as well as the position of the stars from your view. The developer has been hard at work behind the scenes updating the application and writing some API's to allow some new features to be implimented, and this update brings forth a new feature which is pretty neat. Now not only can you look at the stars through the GPS view by entering your zip code, but also you can now use the magnetometer of the PlayBook for a new "point and view" feature. This feature is still in beta, and uses an undocumented and unofficial API and will also require you to calibrate your devices magnetometer, but the application will walk you through the whole process. After PlayBook OS2 is released and the official API is available the calibration will become automatic. The application will set you back only 99 cents, but there is also a free trial available through BlackBerry App World. So what do you say, grab yourself a copy, take the kids out back and show them just how awesome your BlackBerry PlayBook really is?